The Sicredi materiality process conducted in 2014 by the Catavento team was the origin of three projects in 2015. The first one, aiming to expand the connection with the business strategy, evaluated the alignment between Sicredi’s projects and initiatives and its material issues, and also suggested a project priorization tool that incorporates both the contribution to business strategy and the long term performance of the cooperative financial institution. The second phase focused on Sicredi’s reporting, with a benchmark analysis to identify the institution’s forces and improvement opportunities for both Sicredi’s sustainability report and its associated cooperatives. The third project foccused on local development, poiting general guidelines to leverage Sicredi’s contribution to the development of the areas where it operates and suggesting indicators to measure local development, in both the cooperative and the stakeholders point of views. Finally, Catavento proposed a sustainability governance model in order to material issues to be increasingly discussed in the different decision making instances of the Sicredi System, including cooperatives, centrals and Sicredipar. Therefore, sustainability agenda monitoring and control mechanisms were suggested, connecting the agenda to the business and to the strategic vision of the entire cooperative system. Also in partnership with Sicredi , Catavento assisted the revision of the System’s environmental and social risk analysis process, based on the standards established by Resolution 4,327 / 14 of the Brazilian Central Bank and the IFC’s recommendations . In addition to the development of a specific methodology to risk priorization, Catavento contributed to knowledge dissemination and cooperative leaders engagement. Based on the methodology developed by Catavento and adapted to the reality and the operating regions of the centrals, Sicredi was able to improve its social and environmental criteria to the risk assessment in its credit concessions. The need to revisit issues relevant to their business in the context of sustainability, led Sicredi to enter into a partnership with Catavento in 2014. In keeping with this context, we developed an innovative approach, which includes a trend analysis that may affect Sicredi´s business, an assessment of environmental best practices in the financial sector, a process of structured interviews with the company´s members, top leadership and stakeholders. As a result of this process, Catavento traced a number of important issues, which were prioritized according to their relevance. This materiality process, in addition to being fully traceable, lays the groundwork for possible places where Sicredi can become involved and reinforce its business strategy. The Catavento team assisted Sicredi in designing its Sustainability Policy, approved in 2011. The partnership was developed in 2012 and consisted in aligning union superintendents and presidents with the sustainability agenda, e-learning analysis for employees, and preparing an action plan for Sicredi. The material used for this activity was based on a survey of topics relevant to the institution, the Green Protocol and the GRI guidelines in keeping with Sicredi´s goal of publishing its first annual Sustainability Report 2012. About Sicredi Sicredi is a cooperative financial institution with over 3 million members and 1,375 service points in 11 states of the country *. It is organized in a unified operational standard system, counts with 95 affiliated credit unions, divided into four Regional Centers, shareholders of Sicredi Participações SA, a Confederation, a Foundation and a Cooperative Bank, that controls an Insurance Broker, a Card Company and a Consortium Administrator. * Rio Grande do Sul , Santa Catarina, Parana, Sao Paulo, Rio de Janeiro, Mato Grosso do Sul, Mato Grosso , Tocantins , Para, Rondonia and Goias. 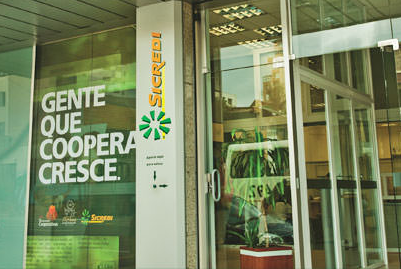 Sicredi is the third largest credit union in Brazil, with more than two million members in more than 1,100 service centers in ten states. Through the development of products and services and sustainability practices, engaging its internal and external audiences, Sicredi is the first financial credit union to implement a Sustainability Policy. The implementation of Sicredi´s Sustainability Policy (coordinated by Sicredi Foundation) is based on three pillars: sustainable products and services, sustainable processes and people for sustainability.